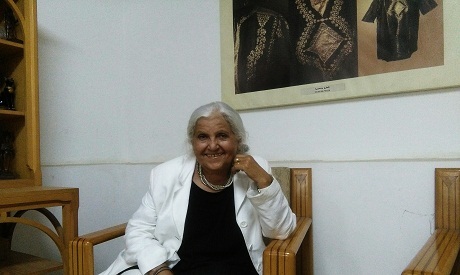 On the premises of The Egyptian Society for Folk Traditions, Ahram Online interviewed Nawal El-Mesiri on the essence of folk heritage and its sustainability in the modern world. "Homemade" was the slogan adopted by the Egyptian Society for Folk Traditions (ESFT) last week to announce the resumption of their cultural activities, which have been put on hold the past 5 years. Tens of people walked in carrying their signature authentic dishes, eager to share the food and thoughts affiliated with them. "We thought the re-launch of our activities would be a homemade cooking event, because in Egypt food is a main attraction for gathering," explained Nawal el-Messiri, a renowned anthropologist and member of ESFT. "We also invited our friends from Arab countries to join us in this celebration, which includes the opening of our latest meeting room where we intend to host lots of folk cultural activities," she added. ESFT has played a leading role in preserving, reviving and documenting traditional handicrafts—such as the art of Talli, and documentation of the Beni Helal Syera (Epic of Beni Helal)—and collaborated in the creation of the National Folklore Archive. Due to security issues in recent years the NGO put a hold on much of its field work, but they believe it's time to resume. The new Cultural Agenda of the NGO includes seminars, workshops, films and support initiatives for traditional folk arts. One craft that's witnessed a rise in popularity is Talli embroidery—a special focus for el-Messiri. "Authentic, handmade shawls have become trendy. Talli embroidery techniques have been practiced since ancient Egyptian times, and the technique has endured. But we need to find new uses for Talli that allow it to survive going out of trend—by using it in curtains for example," el-Messiri notes. "Pottery survived because we started using it in modern ways such as serving plates, not only to make the ola (a clay flask used as a natural cooling device before the discovery of electricity)." With a PhD in Cultural Anthropology from Indiana University, research and life's work at the Social Research Center at AUC, UNICEF and NADIM folk heritage foundation, el-Messiri's experience in training and reviving the Talli craft—centered in Shandawil, Sohag—reveals a lot about how folk arts survive technology, open door trade policies and the harsh hand of time. The trick with folk crafts, she says, is finding sustainability and that sense of belonging that comes with reviving authentic trades and crafts. el-Messiri believes that upper Egypt holds a rich tradition in folk arts that should be supported not only for the sake of the economy, but also to foster a sense identity and heritage, which make people keen to excel in their crafts. Witnessing this first-hand in Shandawil, el-Messiri says that "Shandawil women nowadays are not only the best in the Talli stitching craft, but also trainers in the art." Using traditional crafts to boost local economies, however, requires a whole system of support. El-Messiri argues that the middle industry has to step in and help handicrafts, to see the revival really boom. One important but overlooked aspect is what she refers to as the "comprehensive system of all mother crafts." "In the alleys of Islamic Cairo, you would find the mother trade, which is carpentry for example, then you would find the complementary trades such as kherata (moulding) and oima (handmade decorations). To revive handmade carpentry, you need to revive the whole system so it has an impact on the whole alley," she reveals. "That's what we did when we focused on Talli, I discovered that women do not work outside their homes. there is a man who would bring the women the cloth so they could apply the Talli and then he would sell it for them; thus were they would be able to support themselves. we never focused on individual work, because all handicrafts support one another, and the whole village would prosper."